Srinagar: A complete shutdown is being observed in Kashmir on Wednesday against any tinkering with the Article 35-A of Indian Constitution that guarantees special privileges to Jammu and Kashmir. Shops, businesses and educational institutions are closed and traffic is off the roads in Srinagar and other towns of Kashmir, on the call of Joint Resistance Leadership. Government offices witnessed very thin attendance. Roads are deserted and markets empty amid a heavy presence of government forces on the roads and in sensitive areas to prevent any protests as the two-day showdown started today. Police imposed curbs in parts of Srinagar to prevent protest. The Supreme Court is scheduled to hear a bunch of petitions against article 35A though the Jammu and Kashmir government had asked it to defer the hearing citing Presidents rule in the valley. 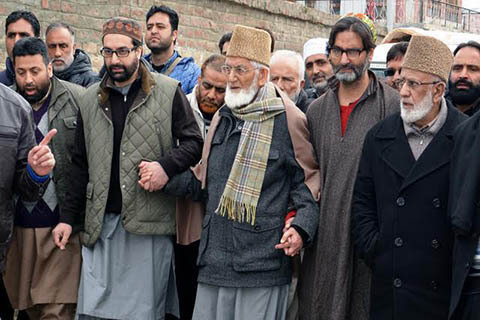 Resistance leaders including octogenarian Hurriyat patriarch Syed Ali Geelani, Mirwaiz Umar Farooq and Yasin Malik, under the banner of the Joint Resistance Leadership (JRL), have given call for a two-day shutdown on Wednesday and Thursday across the state to protest and resist the “(vicious) move” of “late announcement and ambiguity over dates of hearing” in the Article 35-A and Article 370 cases in the Supreme Court. In a statement on Tuesday the JRL warned authorities that if anything adverse to the interests of the people of J&K and its disputed status is announced through the courts, a mass people’s agitation will be started instantly across the state and the responsibility of the consequences of that will be entirely on those forcing us to react. The hearing is scheduled on February 13 and 14 while the state government has requested the apex court to defer the hearing since there is president’s rule in Jammu and Kashmir.